Pheeeeew, Junior is tired! But we're almost home. Uncle Wouter and uncle Jordy are off the train already, and now only Junior and the secretaries are heading home. Uncle Wouter and uncle Junior have recorded a little video for SimParool, and besides that everybody looks at the painting! It is very big! But really pretty! 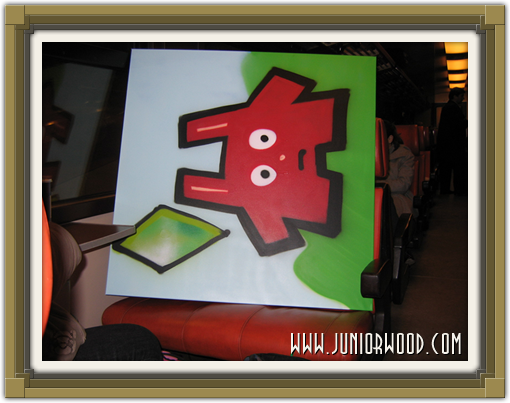 The Freezer Bunny painting in the train! 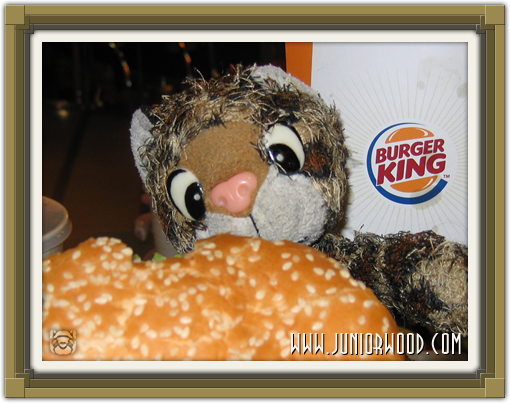 Junior is getting hungry! But we have to wait for uncle Wouter and uncle Jordy and aunt Patricia. We have driven to Schiphol, and the secretaries take the freezer bunny home, because everybody of the group said that was alright! Junior can look at it every day! But we are now at Schiphol to drink Starbucks Frappuccino. Aunt Angela and uncle Martin like it really much, but they are almost not hungry anymore! Junior will drink it all though, because Junior likes it a lot! Later we'll have something to eat at the Burger King's, when the others arrive, and we'll talk some more. Junior has had a reeeeeeaaaaaally nice day, and will end it really nice. Junior will blog again! 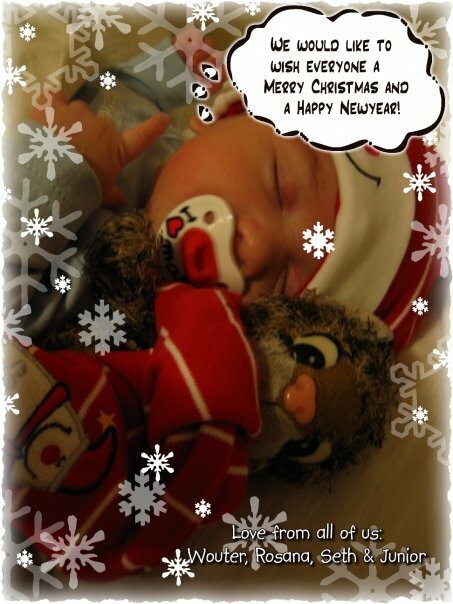 Everybody is now busy with a very special activity, and Junior has also joined! Everybody gets to spray graffiti, with dirty stinking spraying cans. But it's real fun! The male secretary has sprayed the J of Junior on the board, and everybody tried to draw pretty letters. Junior does it together with the female secretary, and we're in a group with the male secretary, uncle Martin, aunt Angela, aunt Patricia (Starrats) and aunt MamaSims (that name is a little weird for an aunt!). All of us are now making the freezer bunny! It isn't going entirely as planned, because the paint drips down, but that'll be okay with a little help! Aunt Angela and aunt MamaSims don't participate anymore, because they can't stand the air really well. 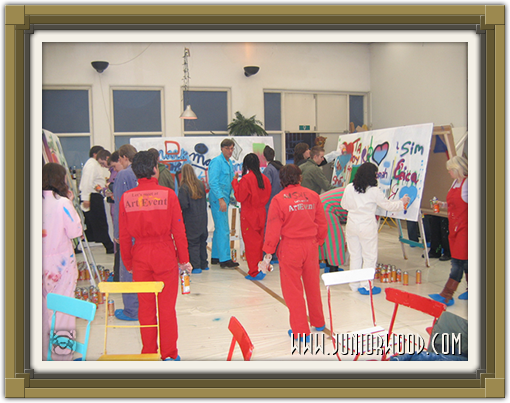 Other than that everybody is busy drawing their own picture of something that has to do with the Sims, all in groups. Everybody is busy being creative. Well, Junior has to get on with it! Later! Bim has given a very nice demonstration of FreeTime! There are many new things in it that all ahve to do with hobbies. Junior has a lot of hobbies too, from playing the violin to blogging and messing with cars too! Sims can do all of that too, so they can have a life just as fun as that of Junior! There is also a genie in a bottle like in Aladdin, and that genie gives a looooooot of money. So Junior won't have to work anymore in the future, Junior only has to wish for money very often! Only Bim said that every time you wish for money the amount decreases, so eventually Junior will not receive any more money from the genie. Junior can also visit secret lots if Junior is really enthusiastic about a hobby. It's too bad you can't change those locations, Junior doesn't like that so much, but it is fun to play with trains and stuff! Junior can even place villages and mountains on the table, like a jigsaw! Sims can also play new games like Fifa, Spore, MySims and The Sims 3 already. 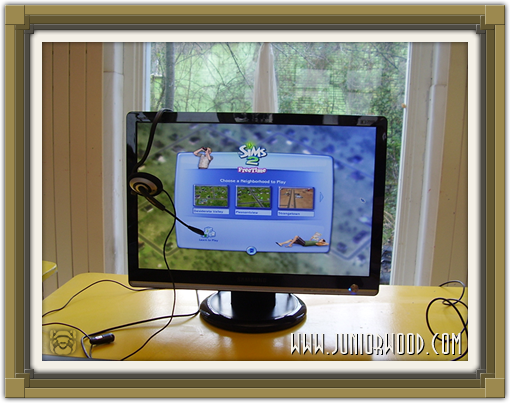 Junior wants to play The Sims 3 and Spore too! But they aren't for sale yet. 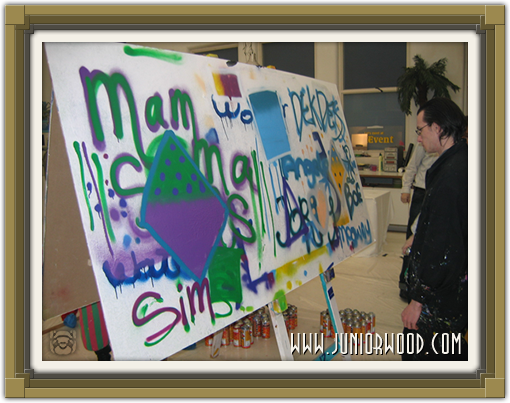 Ook kan Junior geheime kavels bezoeken als Junior heel enthousiast over een hobby is. Jammer genoeg kun je die plekken niet aanpassen, dat vindt Junior niet zo leuk, maar het is wel leuk om te spelen met treintjes enzo! Junior kan zelfs zelf dorpjes en bergen op de tafel zetten, net als een puzzel! Ook kunnen Sims al nieuwe spelletjes spelen zoals Fifa, Spore, MySims en De Sims 3. 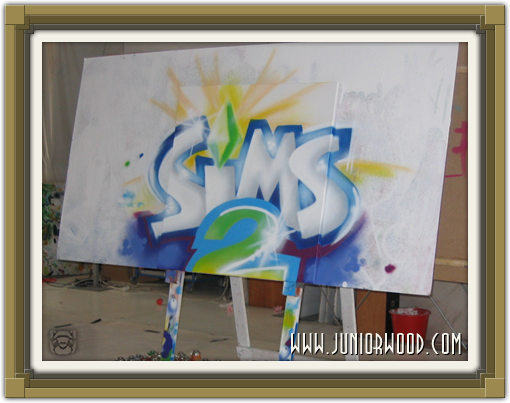 Junior wil ook De Sims 3 en Spore spelen! Maar die zijn nog niet in de winkels. We're all inside! Bim and Anita from EA are also here, as well as many more people! Junior likes it a lot here, there are already five computers with FreeTime on it already, and there's a big TV so everybody can watch along during Bim's presentation. 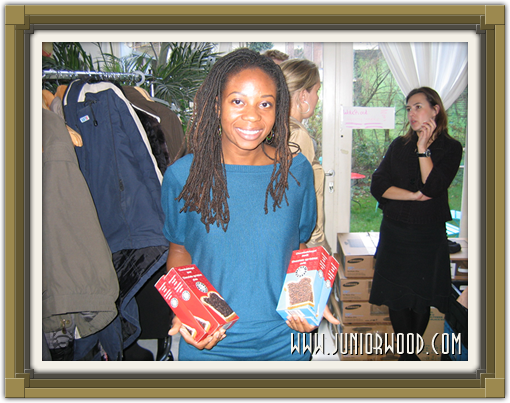 Bim has also received hagelslag from the secretaries, she liked it a lot. Junior will blog about the expansion later! Junior is back again! And besides the secretaries Junior is now also with uncle Martin and aunt Angela! 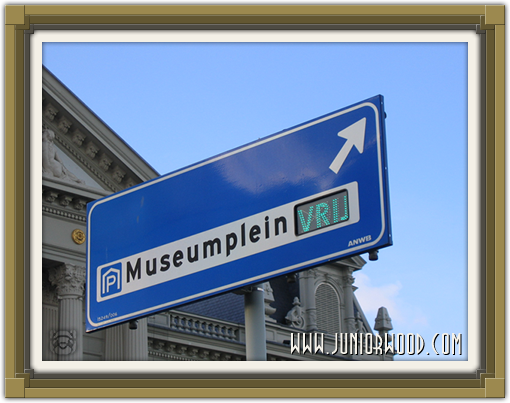 And many more people who Junior doesn't know, and some uncle Rembrandt who is already veeeeeeeeeeeeery old. Junior just doesn't know uncle Rembrandt yet. We can't enter yet but have to wait outside for a while. 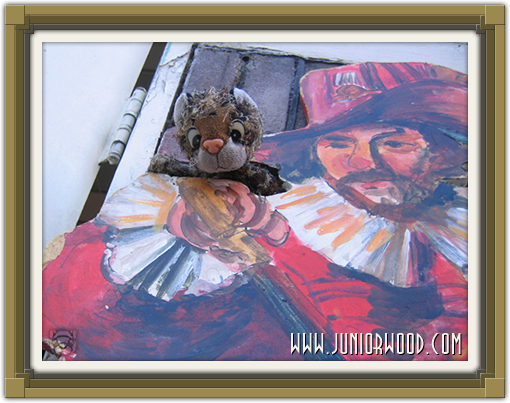 Junior doesn't know if uncle Rembrandt will come in too, though, he is a little stiff. Other than that everybody will go inside to play FreeTime! Junior can't wait, it has already taken soooo long! Wait just a little longer, Junior will blog again later! 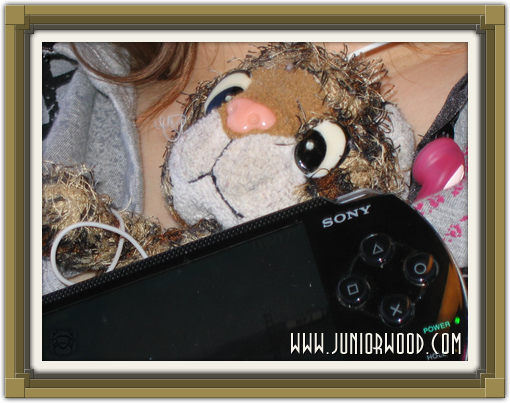 Junior is listening to tunes from the PSP together with the secretaries. The copying didn't go completely okay so that makes Junior a little sad because now some tunes don't work at all! We're already on the train for a long time. Junior is getting impatient! But it won't take as long as traveling to Leipzig or flying home! And Junior has to wait almost two hours before Junior can meet Bim. Hopefully Bim want to have a picture of her with Junior. Junior is really excited! We'll meet aunt Angela and uncle Martin in any moment. The male secretary has told Junior that uncle Wouter and uncle Jordy are already in Amsterdam to play tourist. Junior will do that after the event. Aunt Angela has promised yummy frappuccino! Oh, little Seth is still a little too young to come along, so he is at his grandparents' today. Little Seth always likes that, so he will enjoy it. But Junior does miss Seth though! Until the next blog! Junior is going to play games for a bit and then we have to get off already! Juunnniiooorrrrrrr is traveling again. 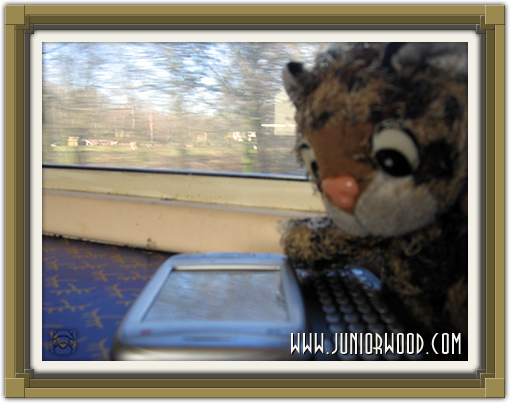 Junior is on the train again. Junior has a really exciting day ahead of him. Junior gets to go with the secretaries (mommycat and daddycat) to Amsterdam! Because Junior has a lot of free busy time, and soon the Sims will too! Today not Tim but Bim is in Amsterdam. She will show The Sims 2 FreeTime there. Junior is very curious and can't wait! But first Junior has to go by train to Amsterdam to get picked up by aunt Angela and uncle Martin. We are only in Helmond now and have to change in Eindhoven. Junior will blog again later. See you then! Junior on the PDA, moblogging! 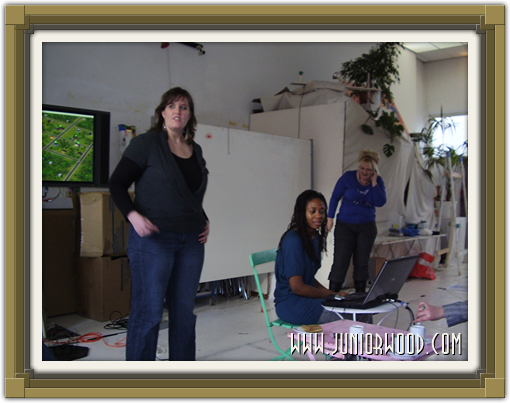 In July, November, December 2006, Junior went to San Francisco. That's in California. And that is in the United States. So... Junior went home. Yes, because San Francisco is Junior's home. Junior can't wait until the family moves home. Oh yeah, Junior was telling about the trips to San Francisco. Junior can tell great stories! Anyway, Junior has been to California several times. Junior would like to go back, before we go back to live there. Because that will take some time. See, Junior has big news! And Junior is so happy with this news that Junior keeps forgetting what he is supposed to tell! On January 22nd this month mommycat and daddycat will attend another press conference. Junior loves those! Because it's a chance to see aunt Angela again. And of course aunt Starrats. And errrrm, uncle DeKDeS. And let's not forget all the others! Mommycat and daddycat promised Junior to go to Starbucks on Schiphol. Since very recently, they added another Starbucks, before the gates And Junior loves Starbucks! 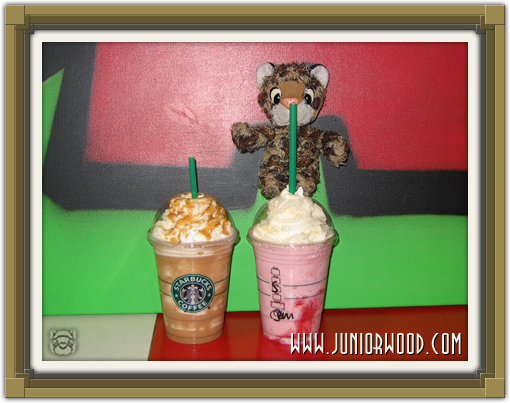 At home Junior drank a strawberry cream frappuccino. And Junior intends to do exactly the same now! If Starbucks here in The Netherlands also has the bottled frappuccinos, Junior may just buy them as well! Because Junior wants to drink frappuccinos at home as well. We wish you a nice and white Christmas, and of course a happy, colorful, beautiful, sweet, nerve-wrecking, creative, musical, 12-month-long, energetic, magnificent, culinary, festive, uncomplicated, joyful, cute, nuts, nice, sunny, 366-days-long, splendid, not-sooo-2007, warm, cozy, peaceful, healthy, interesting, smashing, trendy, thrifty, hip, fertile, educational, inspiring, popping, cheerful, enjoyable, great, artistic, luminous, flowing, different, greener-grass-than-2007, insane, flashing, roaring, well-organized, clean, pleasant, marvelous, glamorous, fantastic, tummy filling, diaper filling, progressive, electric, mirrored, tremendous, humorous, crease-resistant, capitalistic, intelligent, random, historical, ending, prosperous, innovative, clear, unbreakable, sporty, technical, loving and especially a fun 2008!